Is it safe to come out now? Has the dust settled? Watching the events at the Hungaroring today has been like the Stepneygate scandal in fast forward mode; as fast as I think I have things settled in my mind, something else happens and I have to do a re-think. The silly thing is that everything was going according to plan. McLaren had a clear performance advantage, Ferrari were struggling and the race was there on a plate for Ron Dennis and his team. Then Alonso does his little stunt in the dying minutes of qualifying and suddenly everything is thrown away, all hell breaks loose and the stewards become involved. And when that happens, you know that all bets are off. Never mind whether the long pit stop was Alonso's idea or the team's, it doesn't matter whether it was all caused by Hamilton's decision to ignore radio instructions from the team - the random penalty-generator has been started and now we can only wait to see what happens. Would it be ten places, as handed to Michael at Monaco last year? All the way to the back, as happens quite often? 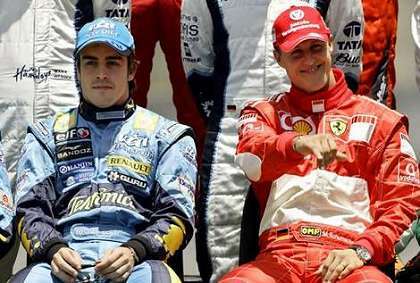 Maybe the loss of his fastest lap, which would put Fernando down to eighth? I suppose you could say that the final result, five places back to sixth, was reasonable in that it was really an internal problem, rather than one that affected other teams. And one must presume, since the stewards had access to McLaren's radio conversations, that they knew that Ron was being a little economical with the truth when he declared that it was all caused by Hamilton being in the wrong position. Hence the exclusion of the team from any constructor's championship points in the race. But I must admit to becoming heartily sick of these incidents that force the intervention of the stewards. They are all caused by over-inflated egos that cannot bear the thought of losing and, in the end, what is it all for? To win the race or even the championship does not make you a better person, it does not make you more intelligent, prettier or nicer to know; it just means that, for a time, you were able to drive faster in a better car than the rest. And, if you had to cheat to get there, you know in your heart that it does not mean even that. There are times when I feel that the stewards really need another form of punishment that is not available to them at present - the right to knock a couple of heads together and tell the miscreants to get on with it.